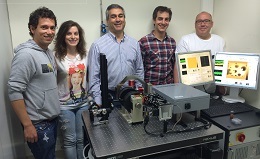 A NanoMOKE3 has been successfully installed in the University of Oviedo, Spain. The machine can perform ultrahigh sensitivity hysteresis loop measurements combined with two different forms of domain imaging. The cryostat option supplied with the machine allows measurements to be made down to 4.2K. The research group running the machine in Oviedo specialises in the synthesis and characterisation of magnetic nanowires made by electrodeposition.